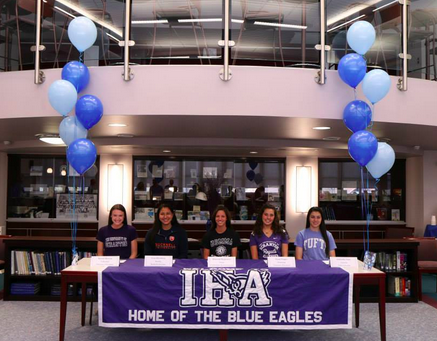 April 21, 2015 was the day five IHA seniors signed to numerous colleges for their sports. Next Fall, the University of Scranton will be receiving Susan Neggia for swimming and Kristin Kirwan for volleyball. Gabriella Vinici will be attending Tufts University for lacrosse while Lena Kleinburg committed to Bucknell University for rowing. Deborah Majowicz signed to the United States Merchant Marine Academy for track. IHA congratulates the girls and wishes them luck on their future endeavors!